Like others RAIM has been observing and interacting with the Occupy movements in our region. In contrast to the colonialist messaging of “occupying” many have pointed out that Amerika is already occupied stolen land. And that the 99 percenters in Amerika are still part of a small percentage of the richest in the world. MIM (Prisons) is a group that shares with us similar analysis of the Amerikan and First World labor aristocracy. This article by Wiawimawo reminds us that populist demands like those espoused by the Occupy movements can often lead to tacit support for imperialism and fascism. Reposting this article does not imply organizational affiliation or endorsement. Recent demonstrations in U.$. cities have claimed to represent “the 99%” opposed to the greed of the richest 1%. MIM(Prisons) supports a more equitable distribution of the world’s resources. What most Amerikans don’t realize is that a true redistribution of wealth would mean less for them as they are all part of the richest 13%. The material conditions of the U.$. invasion of Vietnam forced Amerikan youth at that time to take a more progressive position than today, leading them to come at odds with white nationalist unions. The OWS! actions are even more within the realm of white nationalism than the so-called “Battle in Seattle” in 1999 where anarchists and environmentalists linked arms with unions to oppose the World Trade Organization. Only the likes of MIM and J. Sakai recognized the reactionary, white nationalism that anti-WTO sentiments were being focused into within the Amerikan context. Yet, at least the anarchists had a healthy dose of internationalism motivating them back then. With OWS! the principal cry is “defend the Amerikan middle class.” While anarchists are attracted to the form (spokes councils and consensus open to “the people”) the content is hopelessly white nationalist. It is the exact type of rhetoric that the social democrats of post-depression Europe spit that led to the rise of fascism in many countries. (1) When the privileged nations of the world feel their privilege is threatened they become uncharacteristically politicized in their demands for more. They attack the ultra-rich in order to create the illusion that they are poor in comparison. But facts are stubborn things, and the interests of Amerikans lead them to cry for the ultra-rich to defend Amerikan jobs and back the massive lines of credit they have taken out. Both demands are incompatible with the struggle for migrant rights, which has been in vogue among the white nationalist left in recent years. MIM always said, if real economic hard times hit the imperialist countries, we would see a rise of fascism more than an interest in Maoism. We say this not to instill fear and emotions but to promote a realistic assessment of conditions. Amerikan youth are the ones who put their bodies on the line in Seattle and now in New York and elsewhere. Because of the decades of life they have ahead of them, young people have more interest than their parents in transforming this world to a more equitable one. But to do so they must see things for what they are and get behind the real forces for progressive change. Is a higher resolution available of the image? I would like to print this out to hand around at Occupy Toronto. Or if you comrades could make it in a pamphlet form even better! The graphic and article are from MIM Prisons. Found a higher resolution image here: http://www.prisoncensorship.info/art/occupywallstreet.jpg I can see if I can put it in a pamphlet form, good idea. it is a logical fallacy to call the ninety-niners a part of the richest 13% — it presumes that wealth is distributed equally amongst the entire US population, which it is most certainly NOT (the US has one of the highest income inequalities of any industrialized nation). is there global privilege? heck, yes. hard to deny when “food riots” are — quite literally — a foreign concept even in the minds of our impoverished homeless. we keep our poor, our hungry, our working class on life support, at least — to quell the inevitable revolution. This doesn’t entirely make sense. 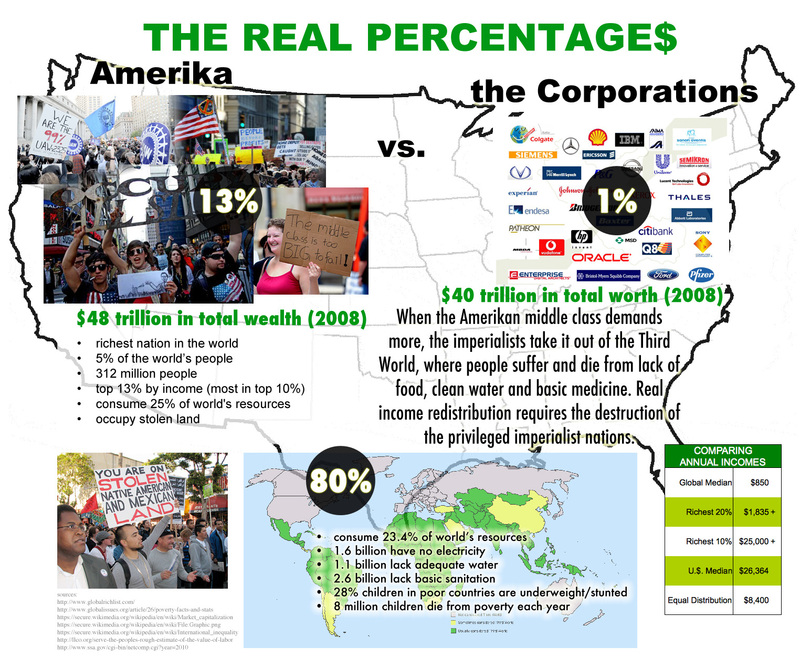 Saying all Amerikans (or the “99%”) are part of the richest 13% globally does not imply that wealth is distributed equally amongst them, any more than pointing out Amerika has a richest 1% implies that wealth is equally distributed amongst this group as well. It’s a factual statement (which may be right or wrong) that doesn’t directly imply much actually beyond wealth stratification. In fact, one would make the reasonable assumption the wealth within the world richest 13-20% or amongst Amerika’s richest 1% is unevenly distributed as well. Next Post Is Violence and War Part of Human Nature?